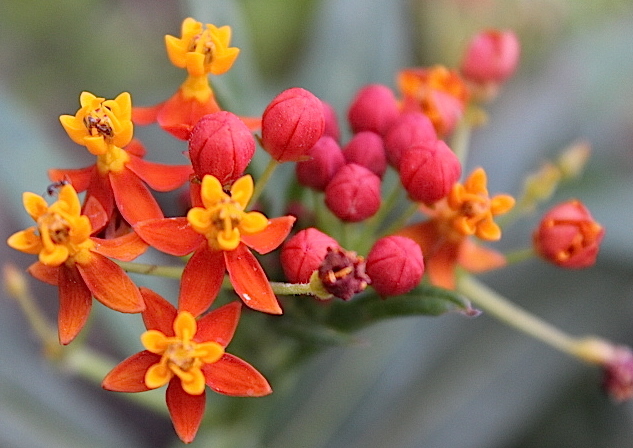 The motherly milkweed provides sustenance to the Monarch butterfly and is crucial to sustain the species. 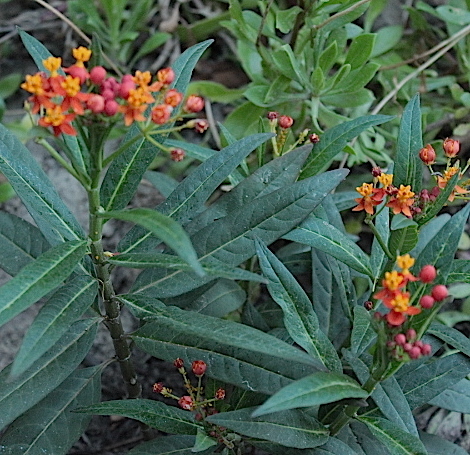 Everyone who loves butterflies should plant milkweed and since NObody doesn’t love butterflies, there should be enough milkweed planted to sustain the entire cosmos. To clarify, I’m not referring to the plural of one my fave cocktails, but the cosmos of our universe. 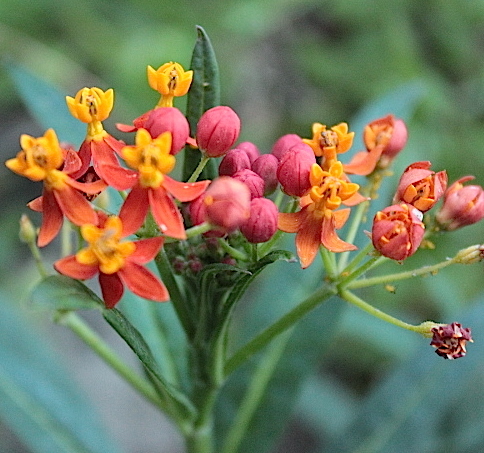 Please plant milkweed to support monarch populations, and their incredible migration! 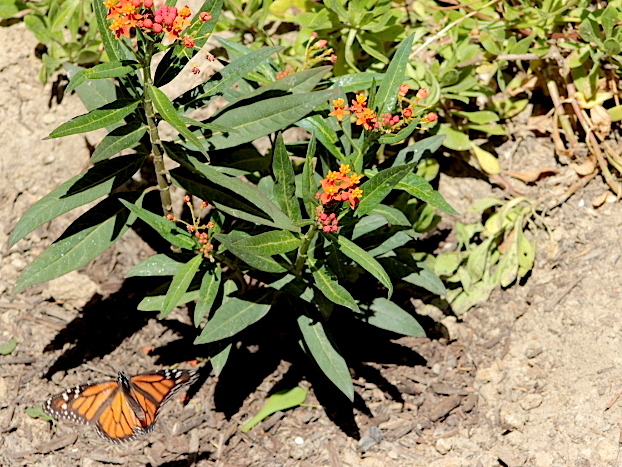 Planting milkweed is a great way to help other pollinators too, as they provide valuable nectar resources to a diverse suite of bees and butterflies. 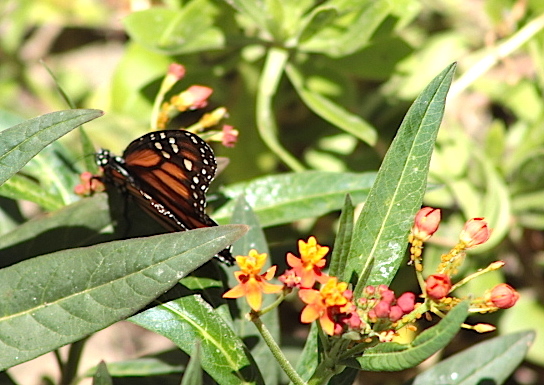 For a brief how-to flyer on planting and gardening, download MJV’s Gardening for Monarchs or the Wild Ones “Wild for Monarchs” brochure. 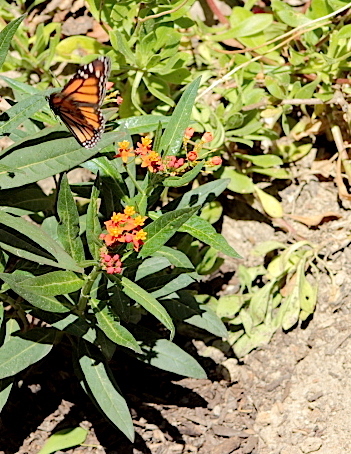 As soon as I put the plant in the ground, it became inundated with all the Monarchs in my little part of the world. I planted it FAR away from the vegetable garden so the hungry little caterpillars wouldn’t decide to vary their diet and eat all my veggies. PlantPlay Nursery in Carlsbad. A Gardening Oasis. In my not-so-little town of Carlsbad, nestled between all the destruction from too many years of overbuilding, you can still find beauty if you look for it. If you live anywhere near San Diego, you really need to drive up the coast and experience this most unique and beautiful garden shop. PlantPlay Nursery at 4915 El Camino Real in Carlsbad is tucked away in a corner near Kelly Drive, south of Tamarack Avenue. If you remember the old Country Store with the chicken on top of the building, you know exactly where it is. It’s also chock full of drought tolerant plants and exotic specimens. Owners Mike and Sergio know EVERYTHING about plants and planting. Here’s Sergio and his baby girl. Look at this sweet face! This chicken is so soft and feathery. The prettiest chicken I’ve ever seen! FYI, the chickens are PETS, ‘cos Mike and Sergio LOVE animals. 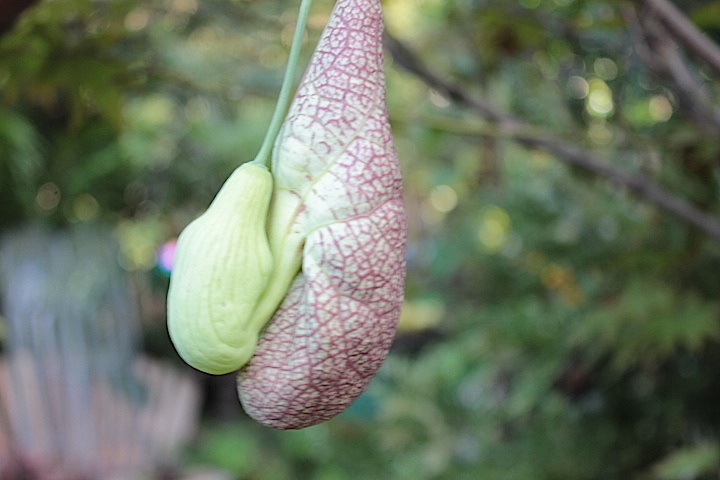 Dutchman’s Pipe, strange but beautiful! A rose, of course. This camellia is as fragrant as it is pure and velvety white. Old wagon on the hill. There’s not much left of the charm of old Carlsbad, so this is an especially poignant reminder. When you visit Sergio and Mike at PlantPlay Nursery, tell them Princess Rosebud says hello! Elephants, wolves, coyotes; helping to raise awareness and rid the world of animal cruelty is a depressing mission, that’s for sure. 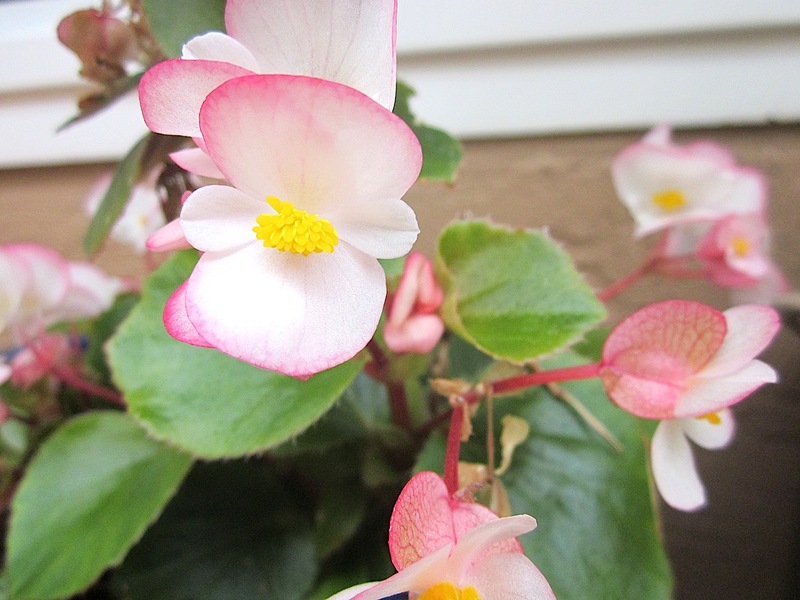 It makes me appreciate even more the beauty in a flower, especially flowers in every shade of pink. 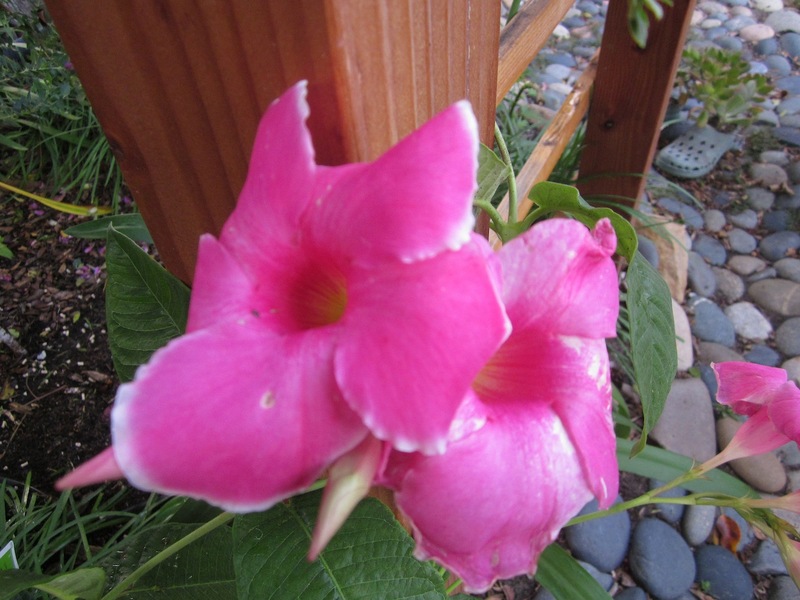 Mandevilla — I call it a “Hello Kitty” pink. 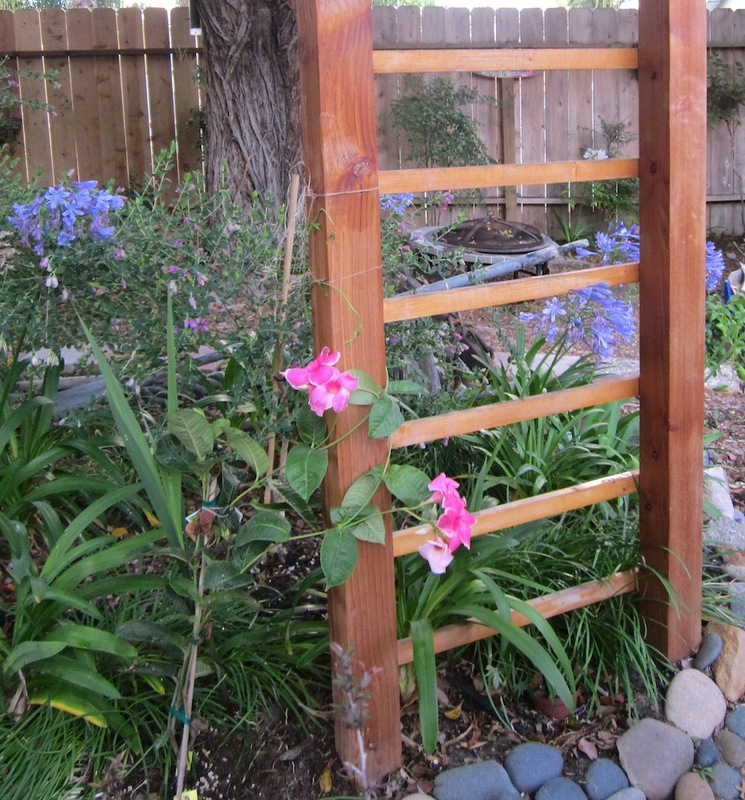 I can’t wait ’til it completely covers the arbor in pink blooms. When my son was little, we lived in Hillcrest, an older part of San Diego. The next door neighbors were in their late seventies and fell in love with our little guy, the grandchild they never had. 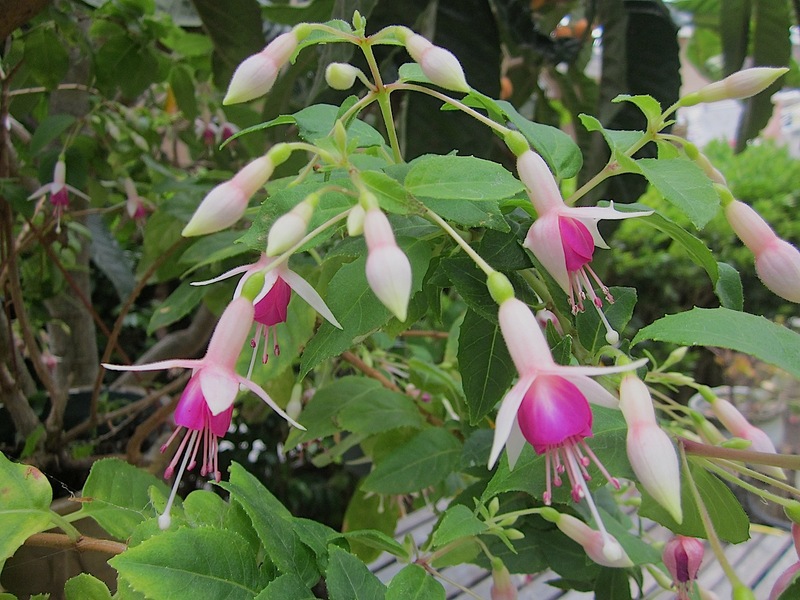 They were both amazing gardeners and taught me how to propagate and grow fuschias and I’ve loved them ever since. It’s so easy to cut off a small piece of new (or old) growth and simply stick it in a pot — and wait. It might take a while, but they all root and eventually grow into these beauties. Hummingbirds LOVE them, too. 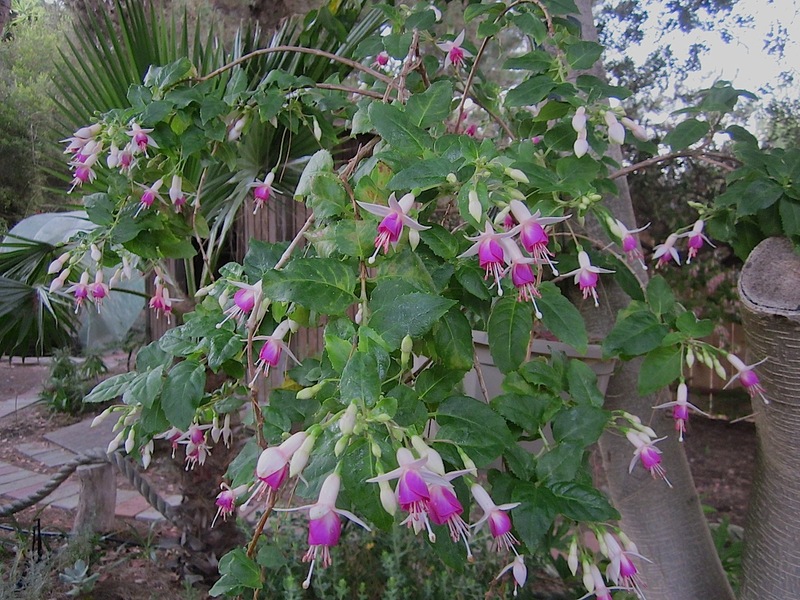 They grow well here in So Cal if they have lots of water; fuschias are very thirsty! Enjoy your Sunday; keep cool and hydrate! It’s not always about Chanel. Yes it is — well, I say yes, our bank account says no. As much as I loves me some designer fashion — especially Chanel — I really don’t like to throw anything away ‘cos I think I’ll always find a use for everything if I save it long enough. merely fill with a little soil and some succulents! Crack a wineglass when you partied too much??? Fill with a little soil and more succulents. Once again, fill with rocks and soil — and more succulents! Yeah, I break a lot of things. More broken coffee cups, more succulents. This is the desert, after all. And yes, that’s a broken tile, too! I painted it black ‘cos it was all rusty, lined the baskets with black plastic, filled with soil and planted begonias on the bottom and fuchsias on top. Did you notice that the basin beneath it is not very photogenic? It will have to go. I found the Trix rabbit whilst digging. No one knows where it came from! No, I’m not from the UK, but sometimes “whilst” is a great word. Tell me about anything you’ve recycled, repurposed, reborn, or reformed. I came late in life to the Facebook party – I’m a FB menopause baby — and it really proved itself as a forum for support and compassion when I was faced with a dilemma. They talked me down off that ledge of compulsive behavior. I’m slightly OCD — I emphasize slightly because it’s not something that cripples my daily life, and I mostly kind of love and embrace all my little idiosyncrasies. I think it’s kinda cute to be SUH-LIGHTLEE crazy. It’s what makes me ME. It might be a bit tough to be married to ME, but my tugboat man is pretty cool with it. Hold on a sec, I’ll be right back, I see a picture on the wall that’s off just a skosh, I gotta go straighten it out. ………………………………………OK I’m back. Whew. All better. See, it comes in handy to be slightly OCD, who needs a level when I’m around? Right? I can eyeball a shelf, a pic, anything slightly askew – I have a built-in level in my brain. Don’t get grossed out — but a few days ago I was sitting on the….ahem…toilet. Right across from me there’s a floor shelf unit with towels, my hair dryer, iron, straightener — and a ton of seashells. I had lovingly arranged each one in a specific location. I noticed a shell/rock combo shifted and was facing in a less than feng shui direction. It bothered me enough that I stopped what I was doing — ahem — got up, shuffled over, YES, pants around my ankles, moved them a smidgen, and sat back down. I had a bit of a convo with myself about it — should I get up, should I wait ’til I’m done, does it really bother me, and I remembered what my very patient and tolerant hubs always says to me in similar situations, “Is it something you can live with?” and I told myself, “No, I need to fix it, because that’s what will make me happy” so I did and then I chortled to myself thinking about what my tugboat man would say when I shared the story. So…a couple days ago my OCD manifested itself again when I shopped for twine. That’s right, I said twine, not wine. I needed twine for the snowpeas in my garden. 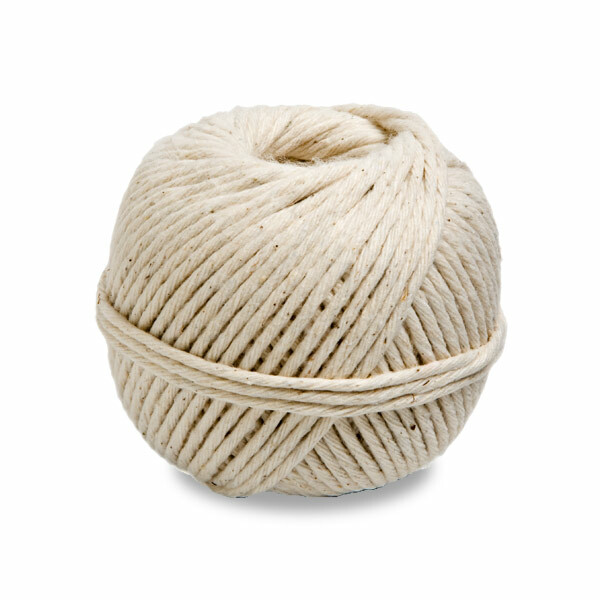 Plain old useful-for-a-zillion things twine. I got tons of much needed help, but the consensus wasn’t clear. 50% voted for a return, 50% said don’t sweat it, remember the dollar store for the next time — and I’m sure quite a few were shaking their heads, thinking they were really glad they weren’t married to me and wouldn’t have to deal with this on a regular basis, am I right, y’all?. Ha Ha! 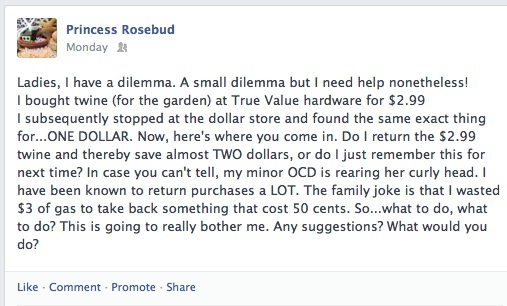 The family joke is that I’ll waste five dollars in gas to return a fifty cent item, and that is absolutely true. On the other hand — designer handbags… need I say more? So… I did my due diligence and felt comfortable with the original purchase and hadn’t wasted any money. I’m grateful to everyone who took the time to share their thoughts and opinions. Social media rocks! It was a definite burr under my saddle for a while. Prolly should have just bought a bottle of WINE and saved myself and everyone else a whole lotta stress! 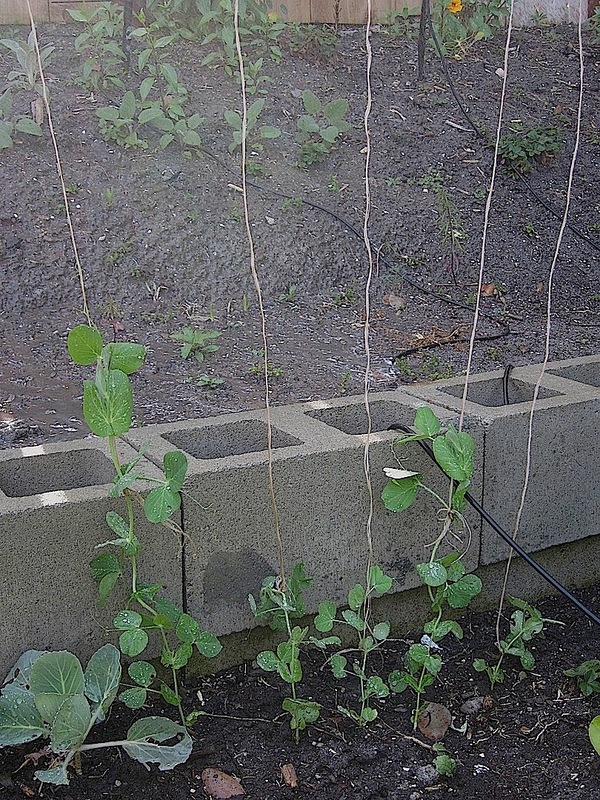 And finally, here’s the twine helping my darling little pea plants grow straight and tall! Are you in the OCD club with me? It’s a cold and rainy Saturday. I’m baking an apple pie and my captain is making yet another shelf for more seashells. Good times, y’all. We don’t have snow on the ground, but some trees do lose their leaves and change color, like this fruit-bearing mulberry. I snapped a pic of a super active yellow finch in our artichoke plant. and more steps to the highest point of our yard planted in California natives-sages, buckwheat, sumac, and cactus. A view to the east of Calavera with Mt. Laguna further in the distance. Check out our lawn and house from the hill. It’s a work-in-progress. I hope everyone is enjoying the last Saturday before 2013!